With Hong Kong being a city enthralled with private kitchens, Mirror Restaurant is yet another one of such establishments in the heart of Wan Chai. Mirror Restaurant is a refined and elegant dinner destination, which serves French cuisine with a modern twist in an opulent yet intimate setting. Mirror Restaurant has attained 1 Michelin Star in 2012, and the owner-chef Jeremy Biasal is an energetic and creative mind who has worked in Alain Ducasse’s restaurants for eleven years before starting this restaurant in Hong Kong. 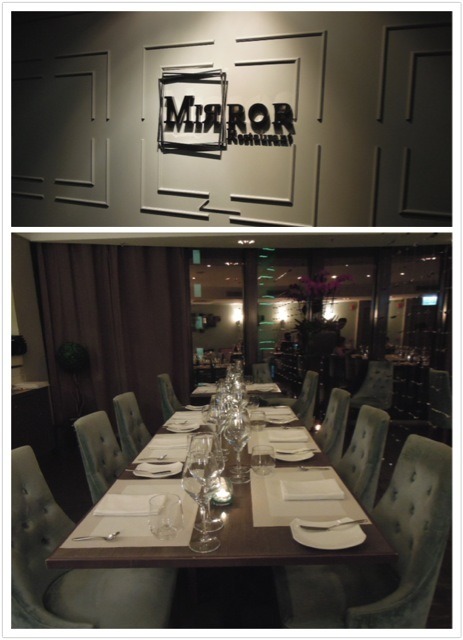 Mirror Restaurant can host around 20 to 30 diners. The setting is very spacious, with tables being set comfortably wide apart. It is only open for dinner from Monday to Saturday, and there are two set menus to choose from: the Mirror Signature Menu, which is priced at $698 for 4 courses and $798 for 5 courses, and the Mirror Tasting Menu, which is priced at $998 for 5 courses, $1198 for 6 courses. The bread basket contains a selection of baguette, wheat bread and bacon bread. The bread at Mirror is not house made and is supplied by La Rose Noire, but it will be reheated in the oven in the restaurant so our bread was still hot and delicious when we ate it. All of us really liked the savoury bacon bread, with just the right size of lovely bacon bits in it – definitely comparable to the bacon bread at The Ledbury (London)! The amuse-bouche was a wild mushroom purée topped with shredded morel mushroom and toast. I loved the creaminess of the purée, and the morel mushroom’s texture was intriguing as it was chewy, with lots of layers to it. 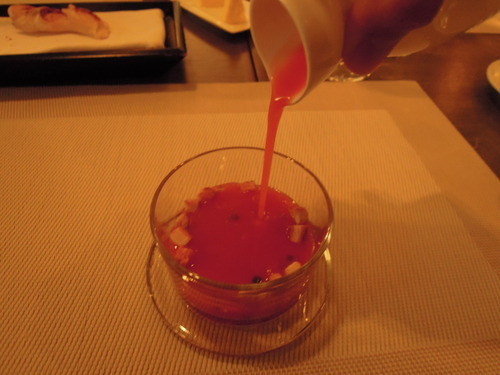 (1) The first course that arrived was the cold gaspacho with pepper bell in brunoise and crispy bread. I liked the refreshing taste of vegetables in the soup, but it tasted a bit raw (in the sense that it tasted of uncooked vegetables). Having said that, I am not a fan of cold soups in general, so I may not be the best judge for this dish. (2) This tiger shrimps jelly with roe sauce and golden Cscietra Caviar, on the other hand, fared much better than the gaspacho. Elegantly adorned with flowers and green apple, the jelly texture was rich and smooth, and the taste of the tiger shrimps was marvellously intense. The chef suggested that we scoop all the way to the bottom when we ate it so that we could taste all the elements of this jelly. The chilled temperature of this dish was invigorating, and the saltiness of the caviar balances out the meekness of the jelly’s taste. (3) This roasted frog legs with watercress and grenobloise sauce and herbs is Mirror’s signature dish, and indeed it was fabulous! The frog legs were delectably fried in butter, and the texture of the frog legs was exquisitely firm and chewy (for those of you who have never tried, it is true that frog legs taste just like chicken, except they are more tender)! 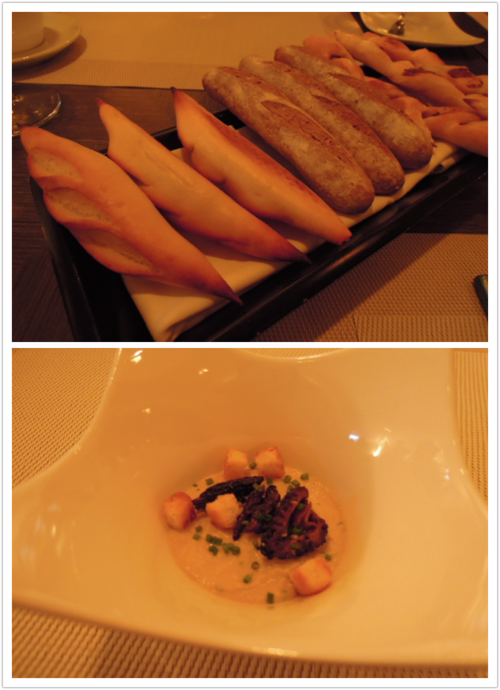 The white wine royale had a light, foamy texture, and its strong garlic taste ingeniously complemented the frog legs. 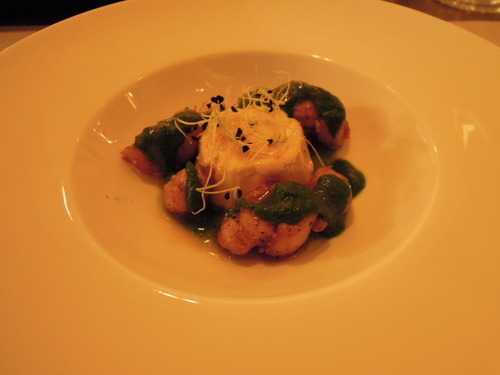 (4) The moon fish tartare, served with lemon mousse and wasabi emulsion, was another appetiser on the menu. The fish tartare should have been colder, the wasabi taste in the emulsion could have been much stronger, and the lemon mousse was a bit bland…however, the ingredients came together quite nicely and I liked the creaminess of this dish. 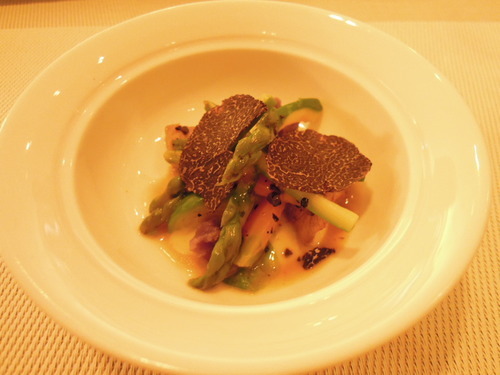 (5) Next was this summer vegetables cooked with Australian black truffle, cooked in vichyssoise sauce. The summer vegetables were fresh and crisp, and the vichyssoise sauce was suitably hot and creamy when it was served. Topped with a few slices of shaved black truffle, this vegetarian dish was simple yet remarkable, and could rival the vegetable tart at Alain Ducasse (London) which I adored! 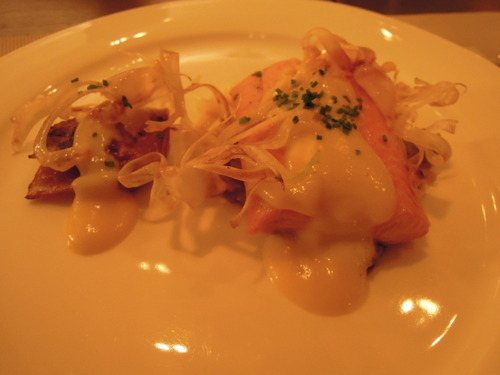 (6) Finally moving on to the main course, I first sampled this poached Trout, fennels braised and confit, garlic safran sauce. The trout was tender and delicately cooked. I loved how it was still raw in the middle, and taste of fennel really stood out. It was an accomplished dish, only tarnished by the fact that the safran sauce was lacking in flavours. (7) Another main course, the Pigeon lightly cooked, in a port and red wine sauce and served with beetroots, figs and radish, was amazing. Pigeons and frog legs are Jeremy’s specialilty, and this lightly cooked pigeon was nicely chewy and beautifully grilled. Unlike some of the dishes which were bland, this pigeon was sharp and tangy. 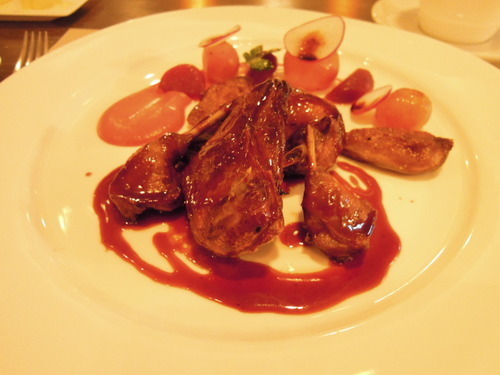 It was very lightly glazed and there was a hint of sweetness; the fig on the side was sweet and pleasant, and the lightness of the beetroot and radish was a perfect match for the intense flavours of the pigeon. 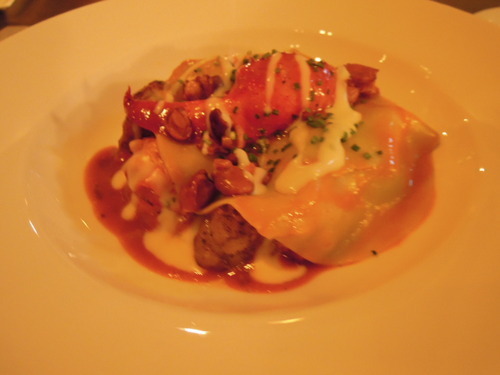 (8) The Maine lobster ravioli, with sweetbreads, eggplant caviar, lobster and cheese sauce was also delicious. The lobster was startlingly fresh, and had an impeccable fresh taste and firm texture. The tomato cream and the cheese sauce were just the right dressing for the lobster, and the ravioli was delicately thin and smooth. 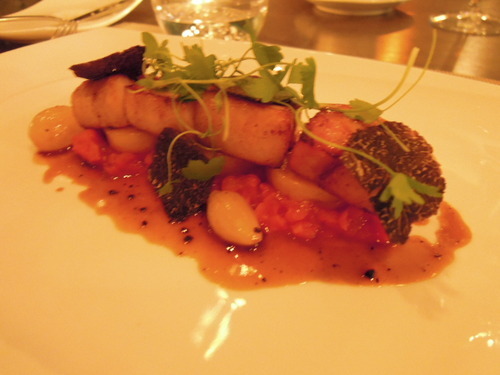 (9) The last main course that I tried was the Sapporo pork belly marinated in milk, served with tomatoes concassees, pearl onions, and potatoes confites on the side. (Just FYI, tomates concassees means hashed tomatoes!) The pork belly was chewy in a good way, and was nicely grilled and had an appropriate level of saltiness. However, there was way too much fat in proportion to the amount of meat. (Also see Liberty Private Works (Hong Kong), Shore (Hong Kong), L’Atelier de Joel Robuchon (London), The Ledbury (London) and Hibiscus (London) for other examples of pork belly.) Even though I adore black truffle, I actually found its addition rather unnecessary in such an intensely flavoured dish. Having said that, the potato confites and the accompanying vegetables very delicious. 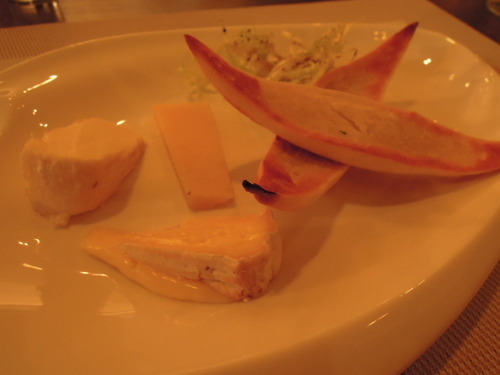 (10) You could choose 3 types of cheese for your French cheese platter from Mirror’s selection, and I picked the (i) Comte AOP, (ii) Romans Fermier and (iii) Pont L’eveque, which were all made with cow’s milk, as I prefer them to goat’s milk cheeses. I thoroughly enjoyed these top-quality artisanal cheeses! 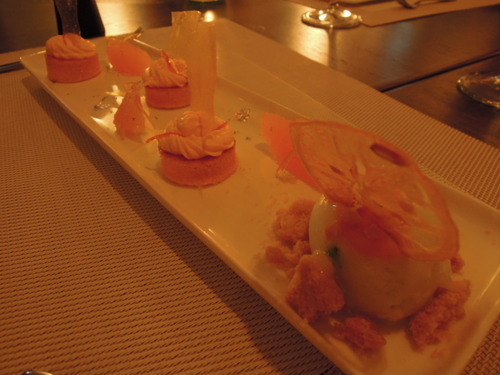 (11) Having devoured some fabulous cheeses, I then moved on to the citrus dessert served with lime sorbet. It comprised of delightful orange cream placed on thick, fluffy pancakes. On the side was a scoop of lime sorbet, which was refreshing and not too sour, and also some crunchy, buttery crumble. (12) Last but not least, this beautiful dessert below is the chocolate and raspberries pie Mirror style, and it was simply the best! 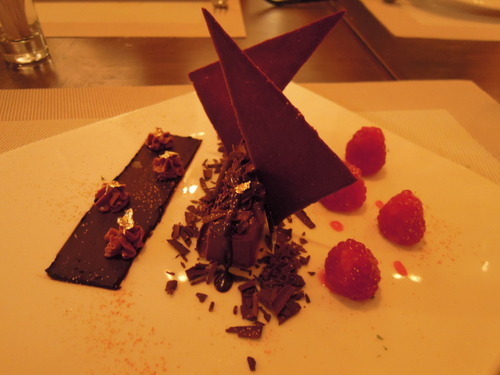 The chocolate used was top-notch, which gave the dessert an exquisite chocolate flavour with just the perfect level of bitterness and sweetness. The texture of the dessert was spot-on and was not too light nor too heavy, and the biscuit base was crunchy and gorgeous. The chocolate paste on the side was smooth and not cloying, and the raspberries completed this dessert! It was time for petits four, and at Mirror, we were presented with mini peach macarons, milk chocolate balls and dark chocolate balls. Even though peach is not my favourite flavour when it comes to macarons, the selection was just so sweet and adorable! 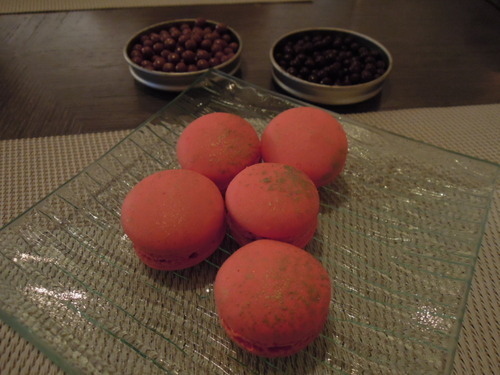 Mini macarons never fail to cheer me up, and will always be the best way to end a French meal! Londoners, you will also be getting your share of mini macarons if you dine at Alain Ducasse (London) and The Capital Restaurant (London)! Conclusion: In terms of food, I have to say that Mirror Restaurant was a mixed bag. 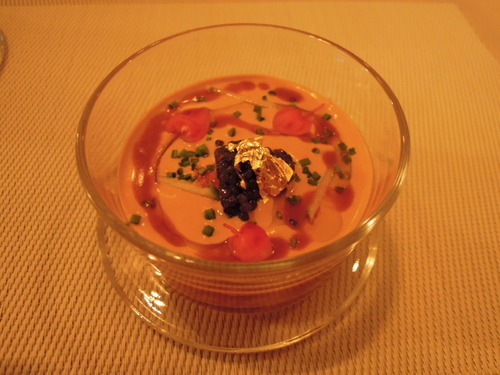 While dishes such as the roasted frog legs, pigeon and chocolate pie were exceptional, other items (e.g. 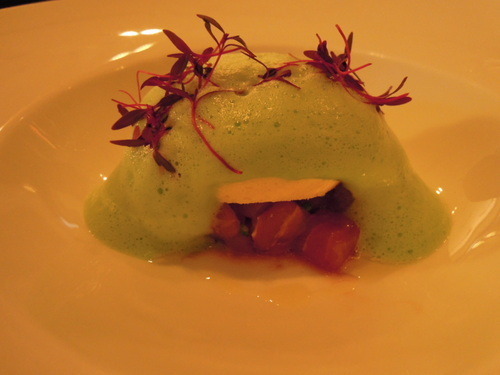 cold gaspacho, moon fish tartare, poached trout) could have benefited from stronger flavours. Nonetheless, given the seamless service, the pleasant setting and the delightful selection on the menu, I would say that dining at Mirror Restaurant was an enchanting experience.